Dutch designer Daan Roosegaarde created a mesmerizing light installation that mimics the effect of the northern lights. 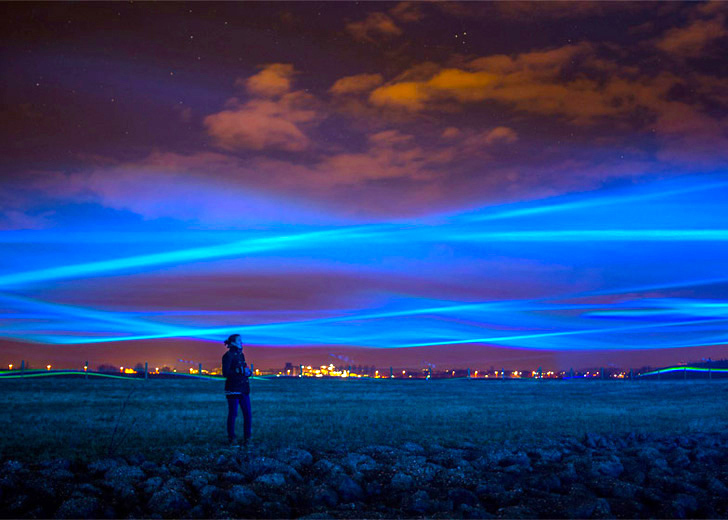 The Waterlicht installation was created above a flood channel of the River IJssel in the Netherlands and is made up of waving lines of light that spread across nearly 4 acres of land. The installation creates the effect of a “virtual flood” that resembles Aurora Borealis – the natural phenomenon caused by charged particles, mainly electrons and protons, entering the atmosphere from above. When viewed from underneath, this occurrence produces wonderful lighting effects. Roosegaarde recreated this effect using blue LEDs to create an impression of water. The LED sources were installed around the periphery of the area and were projected through lenses to focus the light. The beams criss cross in midair and create the illusion of northern lights. The artist created the installation together with Dutch water board Rhine and IJssel in order to raise awareness of the importance of dykes that dominate the area and require daily maintenance. The installation was on display between 19:30 and 22:00 during the last week of February. The installation creates the effect of a "virtual flood" that resembles Aurora Borealis - the natural phenomenon caused by charged particles, mainly electrons and protons, entering the atmosphere from above. When viewed from underneath, this occurrence produces a wonderful lighting effects. 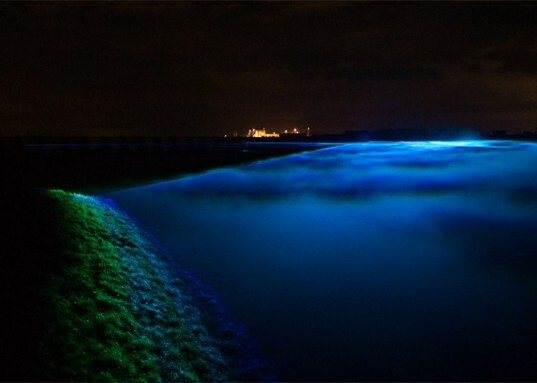 Roosegaarde recreated this effect using blue LEDs which create an impression of water. The LED sources are installed around the periphery of the area and are projected through lenses to focus the light. The beams criss cross in midair and create the illusion of northern lights. The artist created the installation together with Dutch water board Rhine and IJssel in order to raise awareness of the importance of the dykes that dominate the area and require daily maintenance.